"Impress your friends with this classic Middle Eastern dish which can be spiced up or toned down according to preference. Great for chilly autumn or winter days. All the prep time is in the chopping, the rest is easy!" Heat olive oil in a large skillet over medium-high heat. Add chicken thighs, skin-side down, and sear until golden brown on both sides; set aside. Reduce heat to medium, add sausage, and cook sausage until no longer pink; set aside. Stir garlic and onions into skillet; cook until onions have softened and turned translucent. Stir in the carrots, celery, rutabaga, green pepper, red pepper, diced tomatoes, garbanzos, and 2 cups chicken stock. Season with thyme, turmeric, cayenne, harissa, and bay leaf. 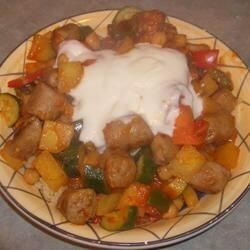 Cut sausage into 1--inch pieces, and add to skillet along with chicken. Cover, and simmer for 30 minutes until chicken is no longer pink. When the chicken is done, stir in the zucchini, and cook until tender, about 5 minutes. While the chicken is cooking, mix 2 tablespoons of extra virgin olive oil (EVOO) into couscous in a heatproof bowl. Bring 2 cups of chicken stock to a boil and stir into the couscous, cover, and keep hot. Serve chicken stew over the couscous with a dollop of yogurt. I used mild sausage, left out the chicken and halved the recipe (only 2 of us). We still had leftovers. Great flavor. Great recipe! I used spicy Italian sausage only, substituted dry mustard for tumeric, and left out the yogurt. My husband loved it! We will definitely make this recipe again. my husband and I both loved this! I used ground Italian sausage and, since I didn't have harissa, used 2 tablespoons of adzhika instead. Will definitely make it again.